It turns out the iPad Camera Connection Kit ($29) can be used for much more than just connecting to a camera. Could this be another iPad surprise from Cupertino? 10 days ago my old friend Peter Kirn at CreateDigitalMusic broke the news that the iPad USB Camera dongle could support audio interfaces that are compatible with the USB Audio Class, noting that "Generally, camera accessory kits aren’t a way of providing audio expansion." Let’s assume, as these sources suggest, that USB audio devices were available via the standard stereo output (or even input) for the public Apple APIs for audio I/O. In that case, the other good news is that iPad apps would be able to support your third-party hardware without special modification of the software, or a signed hardware license agreement. All these little extras are in addition to the kit's described duties of importing photos from a camera connected via USB, and it's lesser-known ability to import photos from an iPhone. Not a bad deal, but it's important to note that none of the above are officially supported by Apple, and they could be turned off in a future software update. 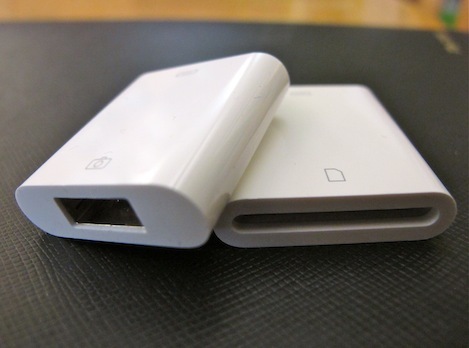 For now, at least, the little pair of white dongles is looking like a requirement in my iPad sleeve. The only problem is that finding the elusive iPad camera kits is like finding hens teeth. A few lucky ducks that pre-ordered the adapters received them early, but everyone else has to wait 2-3 weeks. Mine says that it ships on May 14 and delivers on May 19 (by Standard Shipping). What about you? Update: Opportunistic sellers are hawking pre-orders for between $60 and $65 on eBay. My advice is to pay $29 from Apple and wait the 2-3 weeks. Update2: iLounge posted a lengthy review of the camera kit here.